Landing a 400-pound yellowfin tuna is akin to running a four-minute mile. But when you catch that fish on a long-range boat and adhere to all of the International Game Fish Association angling rules, well that makes it more like a 3 ½-minute mile! Big tuna caught on long-range boats are often not eligible for IGFA records because the angler may have handed off the rod to get around the anchor orused the rail at some point during the fight. Mike Livingston, however, did everything just right and his 405.2-pound monster yellowfin claims world record and now stands as IGFA all-tackle world record. Livingston, a 63-year-old retired school superintendent from Sunland, California, caught his world-record tuna while fishing with Capt. Mike Lackey and crew aboard the 80-foot Vagabond. The angler fought the fish for two hours and 40 minutes. 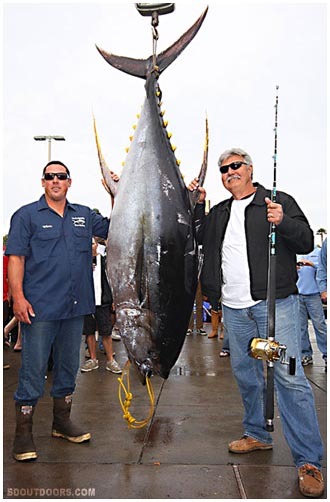 It is the largest yellowfin tuna ever caught on rod and reel in accordance with IGFA rules. Livingston’s catch broke the previous record set in 1977 aboard Royal Polaris. That tuna, caught by Curt Wiesenhutter, weighed 388 pounds, 12 ounces. The IGFA presented Livingston with his world-record certificate at the Fred Hall Show in Long Beach, California.